Edge of Tomorrow sequel sees returning cast and redundant title! Two hapless plumbers are plucked away from their universe of talking mushrooms and fire flowers, and forced to find work in our world. 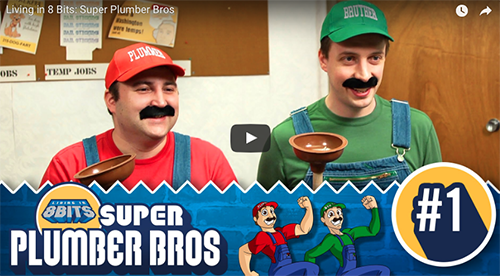 Super Plumber Bros is the new series from the creative forces at Mixed Nuts Productions and Cinevore Studios behind Living in 8 Bits, Nerd vs Geek, and Moot. Starring Joey Christopher, Matt Conant, and Sarah Braun.